With Apple’s $356 million purchase of mobile security firm AuthenTec, for its nearly 200 patents covering fingerprint and sensor technologies, there has been a lot of talk about how Apple might integrate the technology into future devices. Adding to the rumors are recent reports that Apple signed a deal with Sydney, Australia-based Microlatch to develop NFC apps using its fingerprint authentication tech. 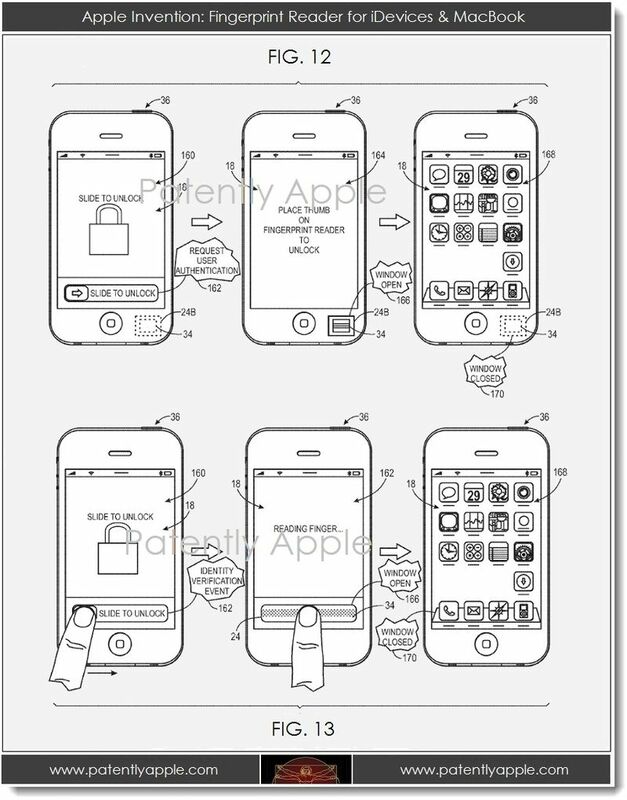 Today, we get a look at some possible areas Apple might be exploring with the technology thanks to a patent application published by the U.S. Patent and Trademark Office and detailed by Patently Apple. In Apple’s patent FIGS. 12 and 13 shown below we see a biometric sensor in context with a fingerprint reader which is initially concealed behind a closed window on an iPhone. Upon the iPhone’s activation in a locked state, a lock screen 160 may be displayed requesting a user to slide a finger across the display to unlock the device. The electronic device may request user authentication to access the handheld device. The device may then display an instruction screen requesting that a user provide biometric data via their fingerprint which will be read by the fingerprint reader. Apple states that user authentication is not limited to unlocking an iDevice. Apple’s patent FIG. 15 illustrates the process in an e-commerce context. To complete a shopping transaction online, many e-commerce websites may require identity verification before the order can be completed. When such a transaction occurs using an iPhone, for example, the iPhone’s camera will provide an authentication screen 180 explaining that user authentication is required to complete the transaction… Upon acknowledgement of the authentication screen, the iPhone may open a window to expose a biometric sensor in the form of an illustrated camera lens as shown in the patent figure. Once the user is properly identified, the purchase could be completed. For more on the patent application published earlier this week by the U.S .Patent and Trademark Office, go to Patently Apple.